Back in February I started using a new method to “compost” my kitchen waste called Bokashi Composting. I took it out to my garden, and dug a big trench. Because I am expecting it to take some time to decompose to the point that it is safe for plants, I chose a bed that I know I’m not going to use in right away. I poured it in–it does smell, but it doesn’t smell rotten. And finally, I covered it with dirt. I dug around a bit every two weeks, just to see how it was breaking down. After two weeks, there were still significant amounts of recognizable material. After a month, I could recognize a few things (eggshells, 1/2 grapefruit rind), but almost everything else had fully decomposed. Also, I have quite a thriving colony of earthworms in my garden, and I watched to make sure it didn’t have a negative effect on them. None at all! Considering it’s still cool, this is about what I expected. I’m hoping to see the decomposition process speed up as it gets warmer. I started over again filling the bucket with scraps, layering it with Bokashi mix, and letting it sit for another two weeks. This past week I dumped another batch into a different garden bed. We’ll see how it looks in 2 weeks, and then in another month. That’s when I’ll be planting my tomatoes! I can definitely see the advantage of buying a kit so that you have two buckets going at a time–one filling and the other fermenting. Collecting enough scraps is easy, super easy, and I could consistently produce a batch of compost for the garden every 2-3 weeks. My worry is that I won’t have space to put the compost when it’s done. I’ve found that realistically, it takes at least 8 squares in my garden to pour it into, and those squares should not be growing anything for at least 2 weeks to a month. I am curious to see if I have 8 fallow squares at a time during the summer. Some have said I can add it to my compost pile, but allowing air into the mix reduces the benefits. Since I almost never turn my compost pile, I might try it to see if it’s a good alternative when my garden is full of plants. I’ve evaluated whether it’s worth purchasing a kit when they’re so easy to “makeshift” an alternative. I’m leaning towards buying. 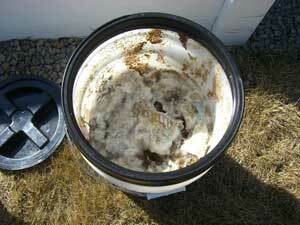 As the food ferments it creates quite a bit of “tea” which you can dilute and add to plants as plant food. There’s no good way to do this with just a bucket. And, I definitely want two buckets going at a time. So I’m off to buy my kit, and I’ll report more as the season goes along! Certain molds are normal and good, other colors are bad. I don’t remember which. As for what to do with your bokashi scraps while your garden grows–do you have any flower beds that could use them? I’ve started to use the Bokashi Composting method because it has always bothered me to throw my scraps out and I never had the ambition to start a traditional compost…besides until this year I hadn’t done any substantial gardening. I only have one bed right now and my husband is making me another but both will be being used…so I don’t know what to do with my bucket now that is is full. The other question I have is my scraps grow mold on the top between putting new scraps in. I couldn’t tell by your picture but is that normal or have I done something wrong? Amber, one way to fill those beds is by using the no-dig method. Plac a layer of newspaper down, then a layer of straw (about 10 cm thick)’ then sprinkle some blood and bone nd then a layer of Lucerne hay (or another nitrogenous plant like pea straw). 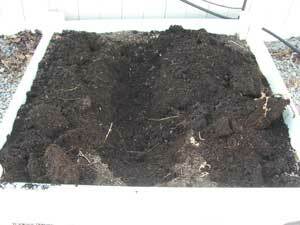 You can then finish off with a layer of soil/compost. You can even just use a couple of handfuls of soil only where u r going to plant our plants, but it sounds like you have plenty of soil. You can then plan directly into the soil. Nice post. I recently started with bokashi and found that it works extremely well in containers. 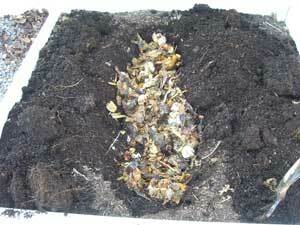 I bury my bokashi waste in containers and mix it with soil. Above the soil I’ve planted tomatoes, peppers, basil and more. As far as purchasing a kit, I’ve been able to make my own bokashi bins for about $4 each. I also have made my own bokashi bran, which cost about 40 cents a pound to make. If you have the time and inclination, you’ll save a bundle making your own. Burying bokashi in the yard is great (I’ve done it once), but so far I’ve found it easier to bury it in containers. I’m brand new to this gardening stuff, but I’ve found that bokashi makes growing vegetables fool proof. I will say that there was a day I would have made these, so props to you! I couldn’t bring myself to buy the kit at $100+. I am trying a makeshift alternative. I bought two 5 gallon buckets (on sale), 2 gamma lids-(on sale). From US pl@st*cs, I bought 2 plastic 3/4″ faucets (threaded ) and something called a “Grit Guard” tm to smash down food. Cost, including shipping $23. DH drilled the holes in the buckets(dont drill too low on the bucket) , pushed in the faucets, put the bolts on- I bought 6 months of mix. Now we just have to eat more vegetables. I would add Kellog N’Rich compost, available at many Home Depot locations. 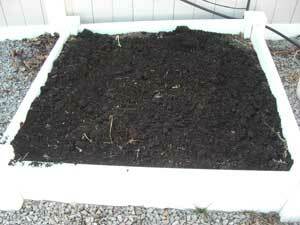 Or, Gardener and Bloome Soil Building compost–I buy mine at my local ag co-op. The N’Rich is $5 for 3 cubic feet, and the other is $12 for 3 cubic feet. I have never heard of Bokashi Composting, but it sure looks interesting! Anyways, those 14 bag were right at $300 total, and still won’t fill my beds up all the way. It is just under half of what I need? Do you have any tips or advice for me, please? I am all ears on this thing. Still looking!